St. Cloud, Minn. – This week the Rox will be back at home for three games that include three great family fun promotions. 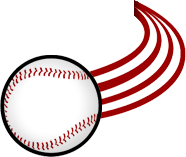 Tuesday, July 7th the Rox will take on the Alexandria Blue Anchors at 7:05 p.m. Gates will open to fans at 6:05 p.m. at the Rock Pile. Tuesday night will be a Chisel Youth Jersey Giveaway presented by Coborn's, Times Media, 104.7 KCLD and WILD Country 99. First 400 kids 14 and under. 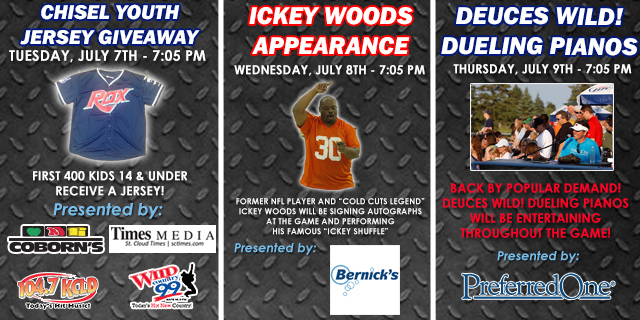 Wednesday, July 8th the Rox will wrap up the two-game series versus the Blue Anchors at 7:05 p.m., gates will open at 6:05 p.m. Wednesday night former NFL Player and "Cold Cuts Legend" Ickey Woods will be signing autographs at the game and performing his famous "shuffle". Rox will wear special Ickey Woods jerseys presented by Bernick's. Thursday, July 9th will wrap up the home stand as the Rox take on the Duluth Huskies at 7:05 p.m. while gates open at 6:05 p.m. at the Rock Pile. Deuces Wild! Dueling Pianos will be entertaining fans throughout the game presented by by PreferredOne.